(NBC4) – A pharmaceutical company voluntarily recalls blood pressure medicines after discovering traces of a cancer-causing chemical. 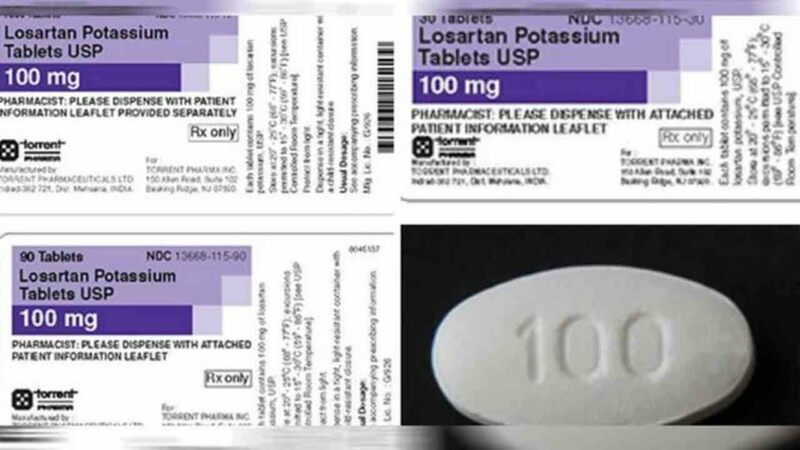 Torrent Pharmaceuticals Limited announced the recall of two losartan potassium tablets on the US Food and Drug Administration's website. The products contain traces of N-nitrosodiethylamine (NDEA), a substance that occurs naturally in certain quantities, food, drinking water, air pollution and industrial processes, and has been classified as a probable human carcinogen according to the International Agency for Research on Cancer (IARC) , Losartan is used to treat high blood pressure, hypertensive patients with left ventricular hypertrophy, and to treat nephropathy in type 2 diabetics. Patients on losartan should continue to take their medications, o fficials said, as the risk of harm to the patient's health could be higher if immediate treatment were discontinued without alternative treatment. Patients should consult their pharmacist or doctor, who may recommend alternative treatment before returning their medication. Officials said. Products affected by the recall are listed below and packaged in bottles. The product can be identified by checking the product name, manufacturer information, and batch or batch number on the bottle of these products.